Featured relationship and matchmaking expert on NY’s #1 News/Talk station on the hit show Change Your Attitude, Change Your Life! When singles feel run-down in the search for love, Julianne Cantarella lifts them back up. This professional matchmaker and dating coach has spent the last eight years championing relationship-oriented singles in New Jersey. Her comprehensive dating services guide men and women to lasting, loving relationships, and she boasts a 93% success rate as a hands-on dating coach. Whether she’s arranging dates or editing dating profiles, Julianne empowers her clients to turn dating failures into dating successes and to have fun while they’re at it. Valentine’s Day can be tough for the unattached. One day you’re fine with being single, and the next, it seems the world has turned into Noah’s Ark; everyone is coupled up. A day dedicated to love and romance highlights one’s relationship status, which might make some singles feel insecure. 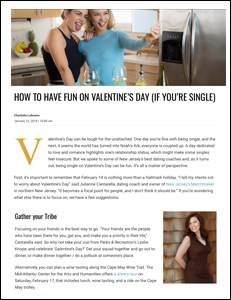 But we spoke to some of New Jersey’s best dating coaches and, as it turns out, being single on Valentine’s Day can be fun. It’s all a matter of perspective. Few of us like to admit we need help, let alone with such a personal thing as finding love. 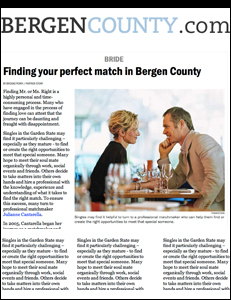 Truthfully, though, we could all probably benefit from a little expert help finding “the one.” For successful singles in New Jersey, that expert is Julianne Cantarella, a licensed therapist with over 11 years of experience as a matchmaker and dating coach. Julianne’s background — working with sensitive therapy patients — gives her the intuition and know-how to help her commitment-minded clients forge genuine, successful relationships. From matchmaking to date-coaching, Julianne Cantarella is the Queen of Hearts. Yente’s got nothing on Julianne Cantarella, President and CEO of New Jersey’s Matchmaker. In addition to her current career as a matchmaker and dating coach, Cantarella is a former social worker that worked with hospice patients dying of cancer or infectious disease prior to working for 12 years as a licensed therapist for those with severe mental illness. 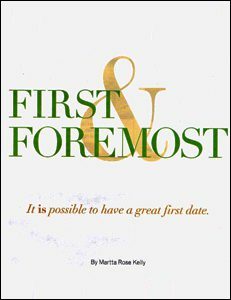 First & Foremost — It is possible to have a great first date. There are scores of articles, blogs, and web sites about horrendous first dates. Yet not much has been written about fantastic ones. Is it a case of not wanting to jinx a budding relationship? Perhaps one needs a little distance from that intitial link-up to gain some perspective. 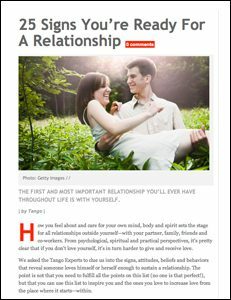 How you feel about and care for your own mind, body and spirit sets the stage for all relationships outside yourself—with your partner, family, friends and co-workers. From psychological, spiritual and practical perspectives, it’s pretty clear that if you don’t love yourself, it’s in turn harder to give and receive love. It is that time of year when love is in the air. Valentine’s Day is upon us, and nervous gents all across NJ will be bending down on one knee to propose marriage to their lovely ladies. (Or, for the non-traditional crowds, any combination in between. Oh, and ladies, you can propose too these days.) 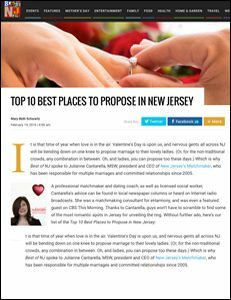 Which is why Best of NJ spoke to Julianne Cantarella, MSW, president and CEO of New Jersey’s Matchmaker. 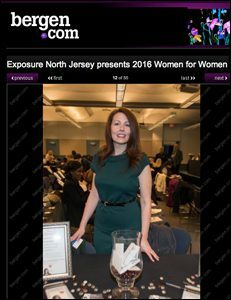 Exposure North Jersey presented its Women for Women networking event at Ramapo College of New Jersey in Mahwah yesterday to discuss the topic of "How to Start the Conversation?” Attendees learned how the panelists have disrupted the unknown, made a change, brought a lesser known issue to the forefront, started a conversation about something they were passionate about and created a support group to initiate a change. What do New Jersey celebrities have over other celebs? Marriage stability. The marriages Bruce Springsteen, Jon Bon Jovi and Wendy Williams have all lasted more than 15 years — that's a marathon compared to most celebrity wedding flameouts. Why do Jersey celebrity marriages last? There are some common factors involved, said Julianne Cantarella, aka New Jersey's Matchmaker and dating and relationship expert. Finding Mr. or Ms. Right is a highly personal and time-consuming process. Many who have engaged in the process of finding love can attest that the journey can be daunting and fraught with disappointment. Singles in the Garden State may find it particularly challenging – especially as they mature - to find or create the right opportunities to meet that special someone.